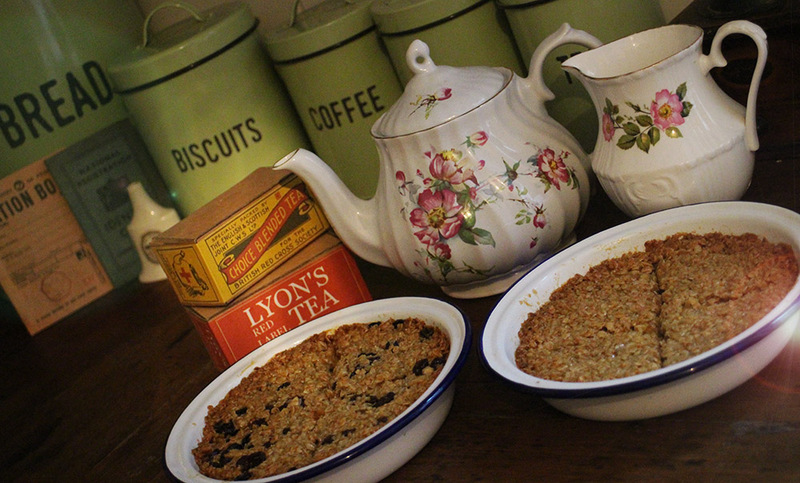 Here is a nice tasty wartime flapjack recipe which I’ve made twice in the last two weeks as I had lots of oats to use up and some hard margarine. I divided the mixture up and added a handful of mixed dried fruit into the second half. You could anything you wanted like some chopped nuts or shredded coconut. Put the butter or margarine and the golden syrup into a saucepan and melt gently. When the mixture becomes liquid mix in the sugar and stir. Remove from heat and add in the oats. (and any additional ingredients you want to add like dried fruit or coconut). Grease an appropriate size container and press in the flapjack mixture with the back of a spoon. Place in a pre-heated oven at 160-180 C for 20-30 minutes until edges are golden brown. Remove from oven and set aside. Cut into slices while still warm. Leave to cool completely before removing from tin. Cost = 80p in ingredients. ← Pantry Makeover – Part 1 + FREE Food Storage Labels. I’ve been looking at school dinner recipes of the 50’s 60’s and 70’s. They were bargain meals as well because the allowance was unbelievably low . 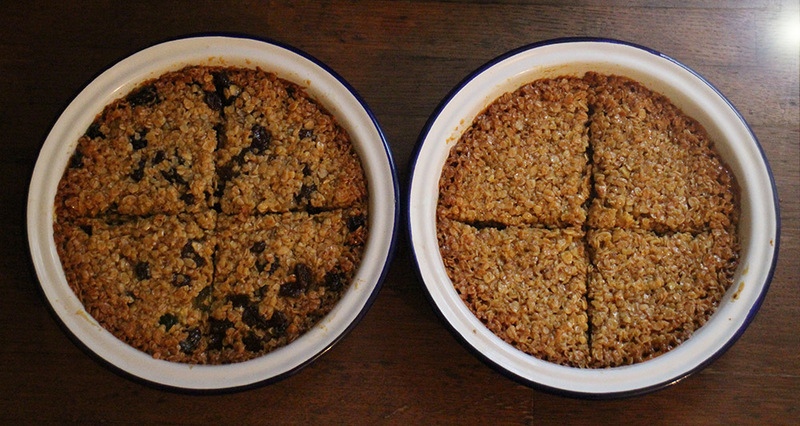 The flapjacks reminded me . Interesting, a flapjack is a pancake in the USA. I would call what you make granola-type bars. Looks good, I will have to give it a try. I kept trying to mentally figure out “flapjack” when it didn’t look like what we are used to in the USA. Makes more sense when I think of it as a chewy granola bar. This is delicious. The only syrup I ever have on hand is maple syrup (Canada eh!) so I used that and because it is thinner than corn syrup I doubled the amount and cut the sugar down by 25 g and let it cook off a bit more. Did not have any mixed dried fruit but did have raisins and ground a few almonds to add.